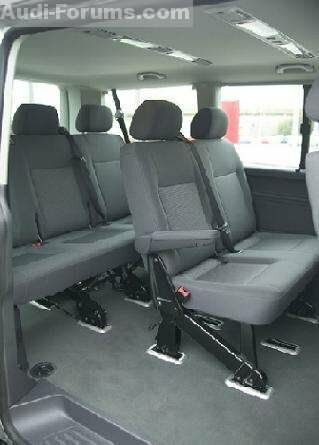 A good 20 months after the successful introduction of the T5 Multivan another well-known name has been added to the Volkswagen Commercial Vehicles product range: the Caravelle. It is the traditional bridge between the Transporter and the Multivan. 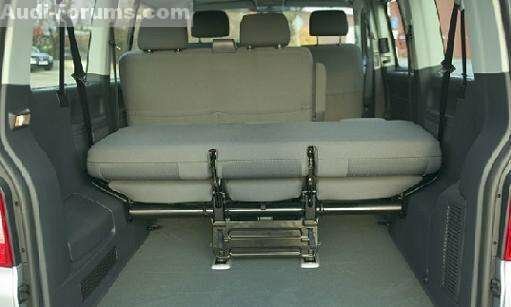 On two wheel bases of 3000 mm or 3400 mm three or four seat benches can be used to make room for a maximum of nine passengers. 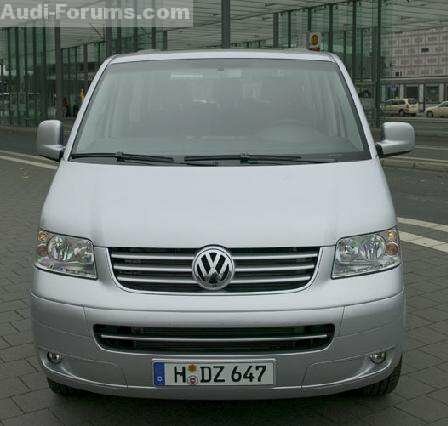 The VW Bus for carrying passengers has the same exclusive appearance as the Multivan. Bumpers, door handles and side mirrors gleam with the same colour as the car itself. The twin headlamps and the side indicators with white glass have been adapted from the Minivan. The Caravelle?s interior is its own design. It features many details designed to provide a greater level of comfort. Many features that are optional with the Transporter Shuttle are fitted as standard in the Caravelle. The high quality seat upholstery stands out in corner art grey or duo pattern corner blue. The comfort package uses understated but elegant anthracite tones to make an impression. The ergonomically designed monochrome instrument panel makes it possible to add a second front passenger seat because of the joystick gearstick unit from the Transporter. 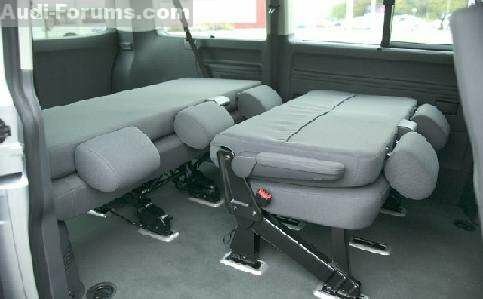 The driver and front passenger seat height can be adjusted as standard and are fitted with armrests and lumbar support. Remote central locking, electric windows and door mirrors that can be adjusted and heated electrically add to the list of standard features. The same applies to the illuminated make-up mirror, the overhead-console with reading lights and the silicone cushioned grab handles. 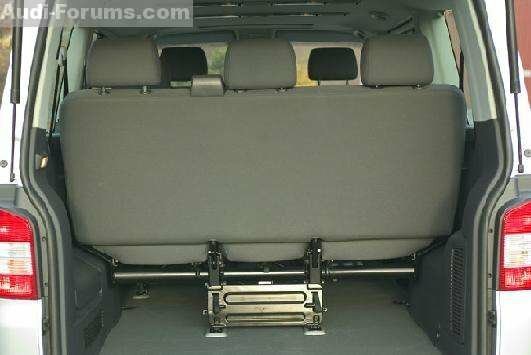 The number of seats in the passenger compartment can be varied according to the situation at hand using the modular mounting system. Depending on the wheel base chosen, up to three rows of rear passenger seats are possible. Thus, for example, the maximum number of seats allowed in the German license class 3, namely nine people, can be obtained using different layouts. 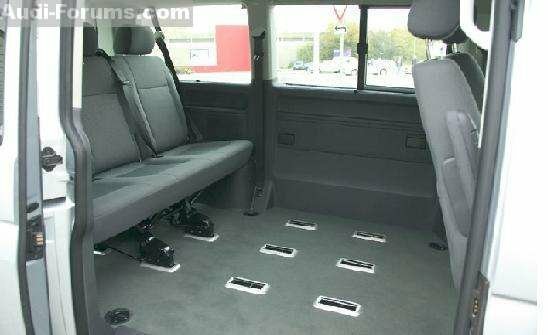 The vehicle?s entire floor in the full-size van is carpeted. The ventilation system in the passenger compartment uses the interior roof ventilator system from the Multivan including integrated lighting stripes. The entire interior uses moulded trim to make a particularly homely and high quality impression. Along with the standard features, an interior package can be added as an optional extra to improve the layout. This includes a radio-controlled clock, pockets in the backrests and the frontmost row of seats in the passenger compartment, chrome plated interior door handles and leather trimmings. In addition an extensible load-floor system can also be ordered for the Caravelle. The motor range is the same as the Transporter. The basic motor is a fourcylinder petrol engine with 85 kW (115 bhp) and a maximum torque of 170 Newtonmeters. The basic motor in the diesel range is a highly efficient fourcylinder which depending on the rating outputs 63 kW (86 bhp) or 77 kW (105 bhp). The torque for the 1.9 l pump nozzle diesel motor is 200 or 250 Newtonmeters. The 96 kW (130 bhp) or 128 (174 bhp) kW five-cylinder pump nozzle diesel engine achieves a torque curve of 340 to 400 Newtonmeters depending on the engine rating. The most powerful motor is the 3.2 l V6 with four valves per cylinder. Its performance data: 173 kW (235 bhp) and 315 Nm. Every five and six cylinder version has six gears and not just for manual gearbox but also for the automatic gearbox. 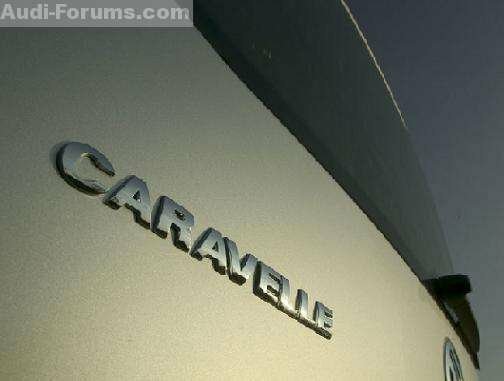 On request, the Caravelle is also available in a four wheel drive version called 4MOTION.